We've seen teasers from the Cars, Monsters University and Pirates of the Caribbean play sets. We've seen the franchise-mixing Toy Box Mode in action. We even got our clammy hands on the game during E3. 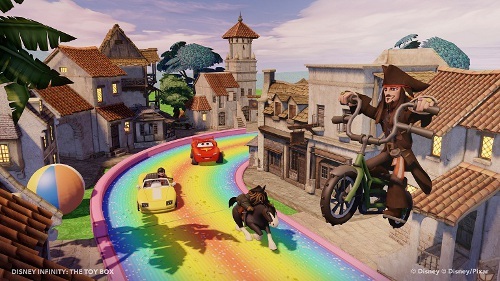 Now it's back to basics with Disney Infinity: a nice, colorful set of screenshots. Ten new images from the upcoming action adventure game show off characters from Toy Story, The Lone Ranger, The Invincibles and more, all hopping about with big grins on their faces as they play together in Toy Box Mode. It's kind of like a sickeningly cute utopia where everybody's just a touch insane. If you haven't been following the news, Disney Infinity borrows some ideas from games like Skylanders Giants and utilizes real-world figures to unlock in-game content. Individual play sets will be sold centered around specific Disney franchises, providing you both in-game content as well as a physical figurine to place on the Infinity Base to "scan in" your content. 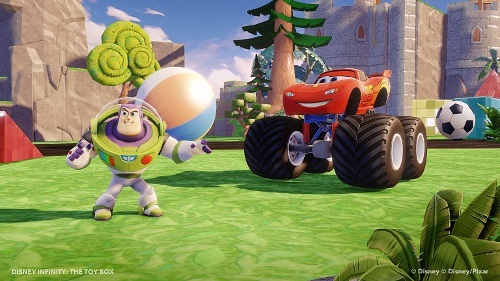 Disney Infinity is scheduled for release on Xbox 360, PlayStation 3, Wii, and Wii U in North America on August 18th and in Europe on August 21st. Co-op supports two local players or four players online. Page created in 0.4130 seconds.